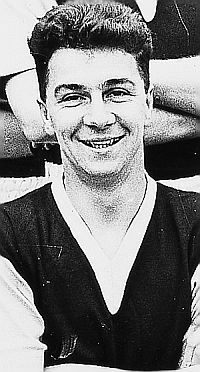 Dougie, a quick outside-right, was signed from Aberdeen in March 1955 and he made his debut at the end of that season although was unable to displace Gray in the team. He eventually did take Gray's place and such was his form in the 1957/58 season that he was selected in the initial 40 players for Scotland's World Cup squad. But just as Newlands had replaced Gray, so the emergence of future England international John Connelly saw another change in the number 7 shirt and that led to Doug asking for a transfer which was granted. He moved to Stoke for £10,000 in the summer of 1959. After one year at Stoke he returned to Scotland where he played for St. Johnstone and Airdrie before managing Forfar. Even at the end of his footballing days he was not lost to sport and became a renowned crown green bowler. In this sad week, our thoughts are with Dougie's family as friends as they are with Billy Gray's.